ExtRoot is a functionality that can be used to outsource the OpenWrt file system of the router to an external storage medium. 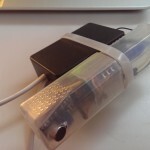 This can be for example a USB flash drive or an external hard drive. 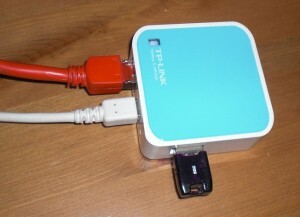 How to set up the TP-Link WR703N for the ExtRoot feature is what I want to show you in the following. For following instructions, I decided to use a USB thumbdrive for the outsourcing of the file system. However it would be possible (as described above), to use an external hard drive for example. Before we can start, a USB flashdrive with the ext4 file system is needed. Theoretically you could create these directly under OpenWrt on the router, but I hadn’t enough memory to install both, the format tools for USB flash drive and the tools for ExtRoot, on my TP-Link WR703N. So I had to create the ext4 USB flashdrive by the help of my computer. How to create a USB thumbdrive with ext4 file system on Linux, you can read here (with gui) and here (by Shell). How you can create a USB stick with ext4 file system on Windows, I have described here. 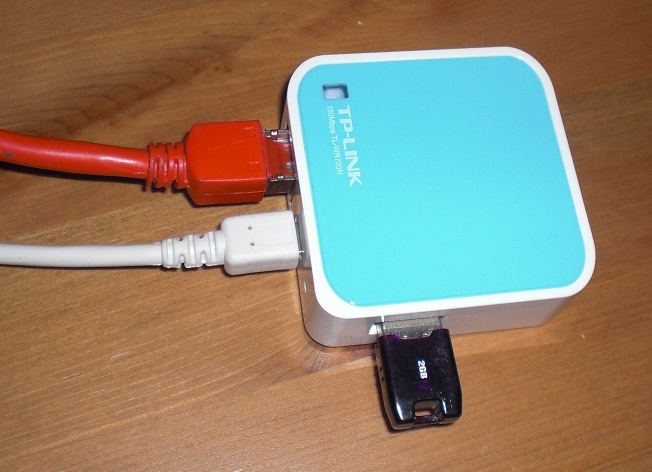 If you’ve prepared your USB flashdrive, plug it into the WR703N and log in to the router by using SSH (e.g. with Putty). First you have to check if your router has recognized the USB flashdrive and if its firmware provides USB storage support. 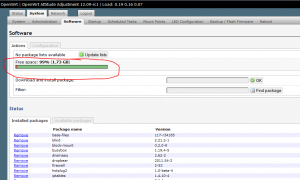 After successful installation of the package you can try to run the first command (“ls /dev …”) again. Now you should see your USB flashdrive listed up in the output of the command. 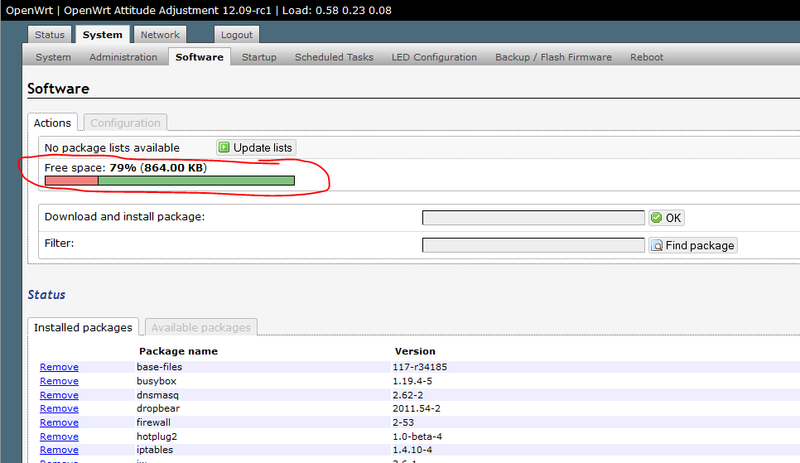 Next we need to install the packages that are needed for ExtRoot and ext4 file system support. This works by subsequent command. Now need to make a small adjustment to the /etc/config/fstab file. Within vi you can change into the edit-mode by pressing the i-key. Then you have to change the following two lines inside the config mount-block. By pressing the ESC-key you can leave the edit-mode of vi. With ! you enter the command-mode. With :w you can save your changes and with :q you can close vi if you’re ready with the editing. Now you only have to restart your router. After rebooting the router, connect again to it (via SSH). By subsequent command you can test, if everything worked fine. In the line rootfs you should now see that the storage capacity is the same as the one of your USB flash drive. A look into the router’s web backend (at the System->Software tab) should also disclose whether everything went fine. That’s it. The article may look like it’s a lot of work to get things done, but don’t be scared by that. It’s done really fast and if you have any questions, then don’t be afraid to write me a comment. I have tested extroot method with root overlay a long time ago with attitude adjustment firmware and I ran into certain issues like my router doesn’t boot after removing usb and it runs fine when its plugged back so I stuck with original firmware and bare necessary packages for it to operate. Now its two years from then and I have installed chaos calmer and looking for root overlay but my previous bad experience is making me think over. Lets say we did all that and its running fine then how about upgrade when next version comes. Should I remove usb and upgrade and attach usb and rewrite all the new files and packages with newer config against new packages or there is an easy way out. To make step 4 work. After you modify the /etc/config/fstab file, make sure you run the command: “/etc/init.d/fstab enable”. This command will ensure that fstab will start [and your modifications are being noticed] every time your router / computer boots. I can’t install block-mount, the system reports out of space. I haven’t installed anything else but the USB and EXT4 packages. The device is brand new, ver 1.6 (according to the label on the back). * wfopen: /lib/modules/3.18.20/mbcache.ko: No space left on device. * extract_archive: Cannot create symlink from ./etc/modules-boot.d/30-fs-ext4 to ‘../modules.d/30-fs-ext4’: No space left on device. * wfopen: /etc/modules.d/30-fs-ext4: No space left on device. * pkg_write_filelist: Failed to open //usr/lib/opkg/info/kmod-fs-ext4.list: No space left on device. * opkg_install_pkg: Failed to extract data files for kmod-fs-ext4. Package debris may remain! * wfopen: //usr/lib/opkg/info/block-mount.control: No space left on device. * wfopen: //usr/lib/opkg/info/block-mount.postinst: No space left on device. * wfopen: //usr/lib/opkg/info/block-mount.prerm: No space left on device. * wfopen: /lib/libblkid-tiny.so: No space left on device. 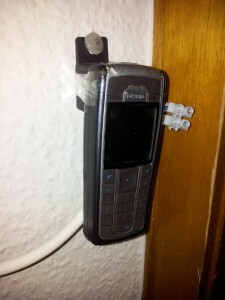 * wfopen: /sbin/block: No space left on device. * extract_archive: Cannot create symlink from ./usr/sbin/swapoff to ‘../../sbin/block’: No space left on device. 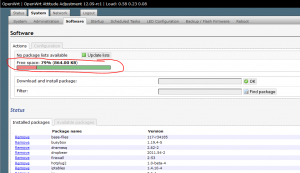 * extract_archive: Cannot create symlink from ./usr/sbin/swapon to ‘../../sbin/block’: No space left on device. * wfopen: /etc/init.d/fstab: No space left on device. * extract_archive: Cannot make dir /etc/hotplug.d/block/: No space left on device. * wfopen: /etc/hotplug.d/block/10-mount: No such file or directory. * wfopen: /etc/uci-defaults/10-fstab: No space left on device. * set_flags_from_control: Failed to open //usr/lib/opkg/info/block-mount.control: No such file or directory. * pkg_write_filelist: Failed to open //usr/lib/opkg/info/block-mount.list: No space left on device. * opkg_install_pkg: Failed to extract data files for block-mount. Package debris may remain! im doing this on a newly flashed mr3020. Excelent…. I followed this tutorial for my TL-MR3420v2 and openwrt 15.05 chaos calmer…. then as test I reboot without USB… then as was told here I could get into openwrt succesfully with my old config and storage of 104kb…. how did you get it to work on MR3420 ver 2.4? what image did you use? ITs Working in my TP-3020, but when I Reboot and go to fstab config file there’s a default file. I can view the fstab file that i’ve beem worked? I searched in /overlay but is empty. Hi, I was just wondering if i copy all the neccessary files into the usb and start from usb, what happens next time if i lost my usb? If you loose your usb stick, your router will boot without all settings you’ve made. So take an image tool and dump your whole usb-stick to an image, so you can recover the image if you loose the stick. Man, your article is very good. It’s help me a Lot… it’s working in a TP-LINK MR3020. I have a v1.7 703N that runs openwrt BB using bugblue’s exploit. I would like to update uboot as well but I was foolish enough to flash with stock BB which disables write access to mtd :-(. Using this approach, instead of moving the rootfs, could I install a custom openwrt that allows write access? 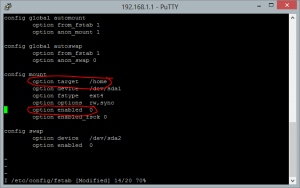 For the new version of OpenWRT the Step 4 dont work! Have you seen this article and especially the parts about “r36988” and “block-mount”? swapon /dev/sda5 ends with “block: failed to swapon /dev/sda5 (-1)”. Works perfectly on airouter with Openwrt attitude 12.09. How can I keep the contents of the usb flash drive after a reset? I followed your instruction but get a few different results when doing the last “df” command. So compared to your result. 1) I am missing the “overlayfs:/overlay” line. Why? 2) The “100% in use” for rootfs, /dev/root and /dev/sda2 is obviously wrong. In the WebUi (Mount Points / Mounted file systems) I get more realistic numbers for “Available” (eg 931 MB / 937 MB), however hte “Used” column is off again (100% 16777216 TB). What irritates me a bit is that in the table below “Mount Points” only the enabled mark for the storage sda1 is checked and not the sda2 one. Is that correct? It worked in my tp link mr3020, thanks a lot. I have a doubt, if the usb stick is damaged i can´t boot my router again? I should make an backup image of the usb disk? Certainly it does not hurt to make a backup of the stick. Nevertheless the router should work without the stick (of course in limited mode without the adjustmends you’ve taken while the stick was plugged in). I have only 15% memory remaining on my 3020 router and it won’t let me install any more packages, not even kmod-fs-ext4 which is necessary for extroot to work. Is it possible to to use ntfs instead of ext4 because I already have ntfs packages installed ? Thanks for providing this information in an easy to use format. I see several people are having problems as their USB drive isn’t coming up as expected. My ext4 partition didn’t show up as sda1 either, but this didn’t surprise me. Maybe you should update the instructions to indicate that sda1 may not be the correct partition and suggest how they identify which one, and how they should change the commands to match. I ran into a problem when I tried to do this where I had formatted a 16GB drive with 8G of FAT32, 100MB linux swap, and the rest to ext4. I followed your directions exactly, half figuring that it would fail because ls showed 5 different sda things. After getting a nasty “you’re out of space” message, ds showed sda7 was the one I wanted to make the extroot point to for storage. ds did not show the FAT32 partition so that narrows things down for my following question. While following your instructions above, how do I point out the linux swap partition (once I figure out which sda* it is? I to am getting exactly the same scenario as yourself with multiple sda’s & I dont seem to be able to run these commands without throwing up an error. Did you manage to sort this out & get this working? I am new to linux. 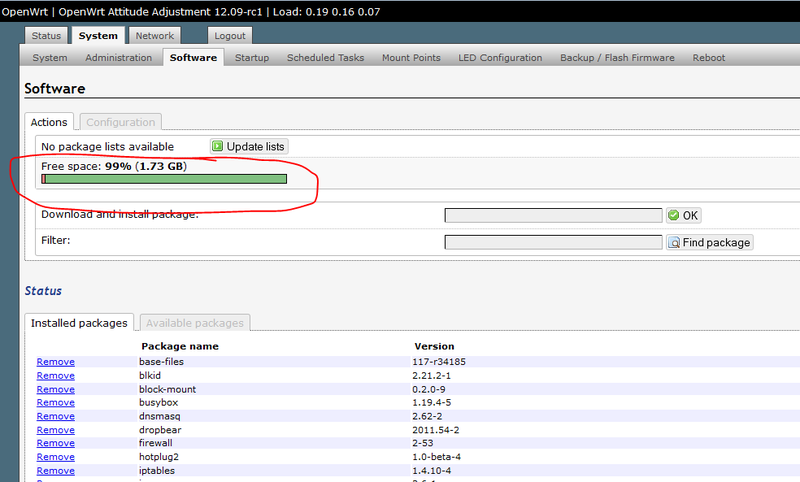 However I managed to install madox image dated Oct 2012 when I first got my 703N. It is working perfect as a client and AP. Recently I managed to extroot using 4gb flash drive as per your instructions. Later I attached a 4 port USB hub and attached the 4gb flash drive, a printer, a usb DAC and also a hard disc drive. I managed to install MPD by following instructions your instructions and succeeded to output music to my earphone. I also managed successfully to install the printer software. Regarding the MPD, I copied only one wav file to the 4gb flash for testing purpose. All my wav files are in the usb hdd, how do I go about accessing the hard disk drive? All the items were available when I issued a lsusb command. You should “mount’ your harddrive. Maybe you have to install some stuff to support the filesystem (like NTFS) of your harddrive. At which point do you stuck? When I replaced the usb hdd with a flash drive, it was mounted as shown on Luci. Let’s say if I ever managed to get the hdd mounted later on, how do I go about linking my MPD music directory to the hard disc drive which contains all my music files. Yes you are right that the hdd is formatted in ntfs. I will read the recommended links and try to solve my problems when I get back from a long holiday. Will update again. After this, what will happen if my flashdrive breaks down? I don’t want to brick my router for this. The router config will be dropped and extroot feature will be forgotten by the router. It will run like it has run before you added the extroot feature. Nevertheless you should simply clone your usb thumbdrive, so that you have one if the first dies or gets lost. I tried it with an SD card and it worked! Thank you!!! is it posible to do this with an sd card? This should be also possible. Just try it. I think an usb sd card reader/writer in combination with a sd card should work. If you tried it and had success (or whatever failed), please leave another comment, so that I can share your experience with the other readers of my blog. I tried to set transmission-daemon on this Wr703n, but it crashes down after about 10 seconds. Do you guess this is a lack of ram problem? Could be, but I don’t know. Have you looked into the *.log files in /var/log ? I fixed transmission crashes by adding a swap partition on the HDD but the owrt system becomes unusable, very very low to respond to the services like ssh or transmission remote. Hm, does it become slow with swap partition or with extroot? With both extroot and a swap partition on the external HDD. Have you tried transmission on the wr703n? Have you installed the “web based” package? I’ve read that this one takes really much RAM. If so, uninstall it and try to use the remote package. Looks really nice. Thanks for the tip. Hope the crowdfounding project will be successful. Thanks for the hint. I’ve fixed that in the article.